Milind explaining the shot to be taken, and director taking a backseat, as he is sitting and listening too, the scene was little complicated , as while cutting a potato Deepali ( the heroine ) sees blood coming out of it and in the same shot when I come and see it, there is no blood. good effective scene which was also shot well. This still picture has Sameer Atle ( Cameraman ) explaining his shot and where exactly the actors should come . 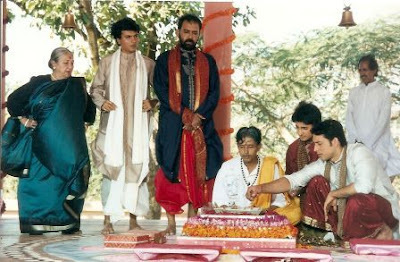 Milind, Manohar , Swaroop kumar & the little girl listening carefully. Now before the shot same rehearsal for the director. 29Th June'08 9.30 pm . I Just had a very long chat over the phone with Milind, dear friend, a computer graphic designer, versatile, talented, very soon will be directing a feature film, was associated with lot of films, I met him on the set of " Mahima Kandobacha " , there were lot of complicated computer graphic shots, very pains taking, needed patience,and he had everything, I didn't know what magic he does till I saw the film, he is amazing. I believe that the day he makes a science fiction or an animation it would be at par with Hollywood. Normally Marathi films have a very limited budget and with all the restrictions he managed to come out with excellent effects, and if he gets the facilities which the westerners have then he is unstoppable. Ekta and I met for the first time many many years ago, for same programme of the channel called ATN, that time Balaji telefilms was also not in the picture, Gautam Chaturvadi and me was doing some comparing programme called Top5, it was a brief meeting, then when Ekta started Balaji Telefilms, I was offerred a beautiful role by Swapna the Directed in suspence thriller serial " Mano Ya Na Mano " produced by Ekta for Balaji, I was surprised to know that the serial was to be shot in Ahmadabad, normal that time producers would shoot in mumbai to save money, but Ekta always thought big, she would do things which no other producer has done, And this began my association with Balaji telefilms, one after another I started working for Balaji, and I was alos very happy till " Kahani tari mari ", after "Mano ya na mano" for me it was "Kaun" with Mita Vashst directed by Anurag Basu, then it was " Bandan " a daily soap with Ritu raj, then " Ittihas " a triple role where I met Sanjay Memane ( now marathi films good cinematographer )for the first time, Ekta had casted me when " Ittihas " was about to begin, I had been to Jituji Bangalow for the muhurat , I had mustaches then Ekta had asked me to remove it , and when the serial started I was not included it the cast, I also didn't care much as I was too busy on television, and the after 450 episodes I was called agains to do this triple role. my track was with the three main ladies on whom the serial was based and smita Bansal who was opposite one of my three character, then came the serial " Karam " Directed by Swapna , the character was KK, and Swapna being my favourate director I enjoyed this serial very much, then came" Kesar" which became " Kuch Khona hai Kuch Pana Hai " directed by again Anurag Basu, we shot the Pilot episode in Shalini Palace Kolhapur, Anu took 19 shifts to do the pilot episode, again this was unheard of on television history, but being Ekta Kapoor, she only could do it. then I was casted for few episodes in "Kusum" I remember only Narayani Shastri from the lot, because she had come on the burning hot set, leaving her comfortable makeup room to see my performance, and I was surprised to see an actor trying to learn from the other, then Ekta called me home as she was casting for her mega serial for Sony television " Kahani Teri Meri " and that day Maratha Battalion was releasing at the Central plaza in Girgaon, Ekta took her sweet time to meet all of us, and my mind was completely in Central Plaza, she narrated the story and the character but my mind was not there, I rushed to the theatre and fortunately or unfortunately the show had started late because of power failure. I had been once for Ekta's Birthday party at Jituji " Krishna Bangalow", and I was the most uncomfortable person there , so left early. Now I haven't met her for ages, just keep reading about her in print, my association with Ekta and Balaji will always remain special and memorable.
" Kahani Teri Mari " in which Manav , Sai, Rishi, Shamaji, Urvashi, Tina, Bunny, Manorama Aunty, Kavita. great cast and great people. Urvashi Dolakia famous as " Komolika ", one of the very pofesssional actors I have come accross, she was already a television star when she was playing this role, so she had a author backed role, and she used to play it well, the Director Gari Binder wanted her to play it similar to Komolika, so it became very predictable, I had a good rapport with her, I used to be amazed to see her do her own makeup, she took her own sweet time to do it, and after hours inside he makeup room she used to come out transformed into that character. She liked to be into her own world, only sometimes her twin kids came on the set she would be different, very happy and jovial. 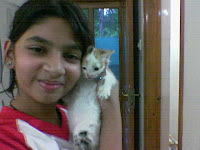 and sometimes would have Sher-o-shairi from her huge stock. 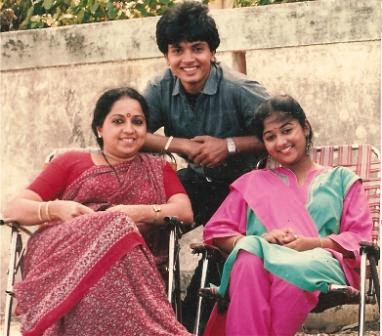 This Serial gave me a opportunity to work with Late Manorama Aunty, such a loving lady, full of love and affection, we spent lot of time listening to her old time stories, her experience, she would go into flashback and tell us things about Amitabh and other actors, she was the most experienced in the " KTM"cast, recently she passed away, she was ill for a long time, she had adopted son called " Sam " who always used to be with her, he took so much care of her, he also had grown old taking care of her. 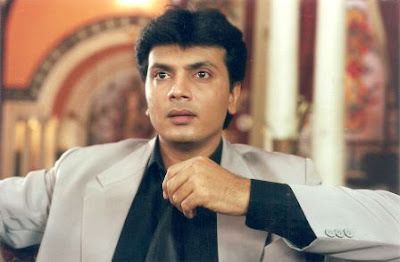 Sai Balla , one of the fine actor on television, he is also a star on Kannada stage which very few people know. The massive set of " Kahani teri mari " was state of art, this who my first serial after doing so much on television which had such a massive and beautiful set, every time I shot on this set I dreamt of my film, one day my film will have such set, I use to visualise my shots and scenes, the moment one entered this set, one had a different feeling, feeling of being rich, being big. Ekta always thought big and she could also afford to think big. I played Debashish in " Kahani Teri Meri " it was a nice positive role but compared to the roles I played in other Balaji serials this role was not that appealing, like KK in "Karma", Nagesh in " Bandan ", triple role in " Itihas " and the role in " Kuch khona hai kuch panna hai " and SO many of them, which I enjoyed, this role was very much restricted, helpless kind. Sai Balla and Shama Deshpande who played my parents in " Kahani Teri Meri " I knew Sai earlier, as we had done a story for Santaram Verma's " Dehshat " that time I didn't know Sai well, but while " KTM " shoot we came very close, he is a great soul, anyone would love to have a friend like him, he is very caring and understanding person, and an happy go lucky person, a tough guy with a soft heart, he and Shamaji are made for each other couple. Sudhir Joshi, Very in jolly person, I had a very very good relationship with him, he loved to tease me, and enjoyed every bit of it, whenever we met he would shout and call me " Gooholi ", and whenever we both got time then it would be very serious talks, lovey man, very very intelligent, happy go lucky, we both did " Devki " and " Mast Kalandar " together, " Mast Kalandar "remain incomplete, which the makers wants to complete it after so long and I will be shooting for the film tomorrow. 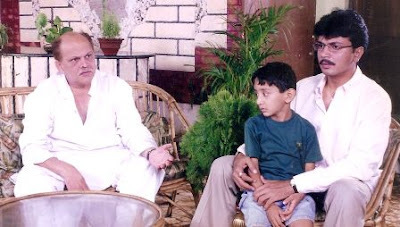 And it will be very difficult for me on the set, as he would not be around and the echo of "Gooholi " only I would be hearing, sudhirji had a heart attack in Bangkok, and had to go through bypass there itself, and after his return from there he passed away in mumbai.I wish he was around. 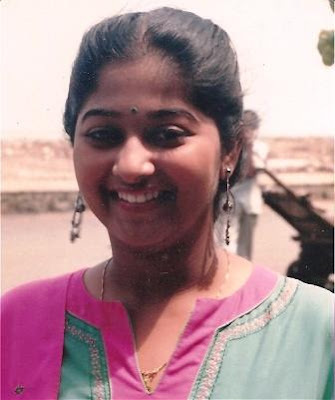 Monisha & her mum, had a car accident near Bangalore while coming for a film shooting, in which her mum was seriously injured and Monisha dead. 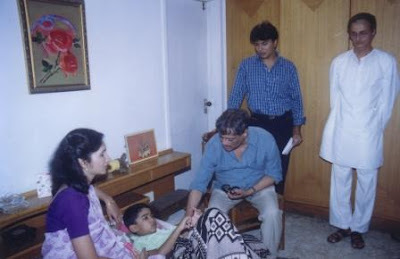 Ajay Bane, the ever smiling face, who is no more now, passed away, had an heart attack, since my Maratha Battalion days he is been encouraging me, he had loved my work, and since then he was always close to me, he did the publicity of many of my films, his advertising firms called Ahswini Publicity was involved in many for my films press, tv ads, premieres, press conferences and he was always personally present whereever it may be, be it poona, satara, mumbai, he was there and saw to it that I was given due respect, as most of the reports & journalist always wanted to interview stars, he many a time forces them to interview me, I felt uncomfortable at time and mostly avoided these press, but he was a gem, always smiling , full of life, I miss him, was a good soul. 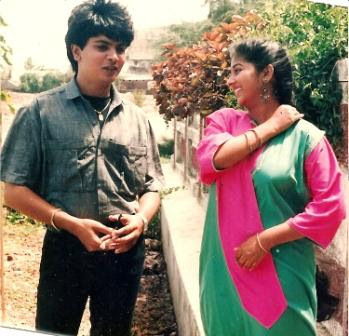 This show was for Zee TV, a for me it was the first time as an Anchor, and I had a tough time, and was not at all good at it, and My co-actor was Ashwini Kalsekar, with whom I had done to two serials which never came on air, she is still a good friend and Ashwini was master in Anchoring, and made me very comfortable, we had great moments while shooting, Yesterday I met Pravin Karale, after ages, he is directing a Marathi film and offered me a nice role in it, unfortunately I had done a similar kind of role in Mahesh Manjarekar's "Aai ", and I don't enjoy these kind of roles, today I wouldn't do Mahesh's Aai, that time also I had expressed my displeasure, but it was the beginning of Marathi film career, so may be I must have said yes, Pravin being a friend with whom I had enjoyed Dak Ghar Apna Ghar, which he used to Direct, we became close friends since then, so this time also I found it difficult to say no to him for that role, when I was looking forward to do a film with him, he is a very good director, hope we work together in future. If you want to see god, I have them for you, soo many of them. His Moruchi Maushi was all time hit play almost since 20 years, in which he Played a woman , the impact is so much that now also directors want him to play the same, and he looks so horrible in the getup, but a lovable person. 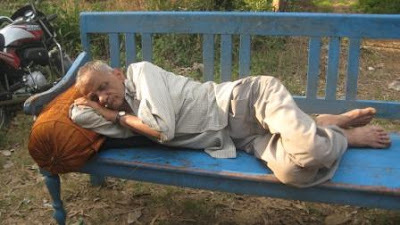 ( still from "Halad"
Madhu Kambikar's Surprise birthday on the set of " Mahima Khandobacha "
Production Manager Mr Kane sleeping on the set of " Kal Bhairav"
Recordist doing the same on the set, imaging the speed of the shoot. Production Manager Kanemama sitting to pay cash after packup. 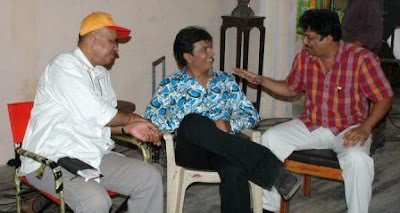 Director Manohar Sarwankar & Costume designer Prakash Nimkar smiles on the set of " Mahima Khaodobacha . Director Reema jokes and I loose concentration before the shot on the set of " Arra Arra Abba "
This photo represents the exact mood of this gang, great moments are cherished for a life time, happiness is the key to success, the message these photographs convey is happiness, be happy and make the world a nice place to live.